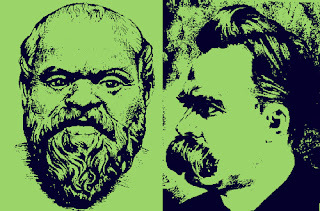 Today is Nietzsche's birthday. He wasn't a big fan of my work. He even committed an ad hominem attack against me in his Twilight of the Idols. He tried to refute me by referring to my appearance, calling me the "lowest of the low" because of the way I look. It is true that I am not the most beautiful person on the exterior. But, as I always reminded people, the mere appearance of beauty is not necessarily the same as real beauty. That can only be found in the soul. I would, by extension, suggest that the external appearance of ugliness doesn't reflect the true nature of the person. Nietzsche didn't approve of my approach to philosophy. He thought dialogue was nothing more than cheap entertainment, and he disagreed with my reasoned approach to life--specifically my arguments about how to attain happiness through virtue. It is a shame I never had the opportunity to engage in dialogue with Nietzsche. I would very much like to examine his thoughts...even if he thinks the elenchus method is cheap entertainment. Is this universe a simulation?